GenePix® 4100A Microarray Scanner offers simplicity, reliability and flexibility that is required for microarray-based research, be it in genomics, proteomics, or novel applications. Built on Molecular Devices award-winning (IBO Design Award) optical, electronic and software design, the sequential GenePix 4100A Microarray Scanner has all the quality, but in a price range and bench-top footprint that makes it ideal for individual lab use. Flexibility to Explore Alternative Dyes: A variety of fluorophores can be used with the GenePix® 4100A Microarray Scanner as its optical design incorporates up to six different user-selected emission filters. Reliable Results: Use the included set of calibration slides on a regular basis to calibrate your microarray scanner for repeatable photomultiplier tube (PMT) performance over long periods of time. In addition, Laser power is dynamically monitored during scanning to ensure constant signal output, and the Hardware Diagnostics Report keeps a record of ongoing scanner performance assessments. Optimize Settings On-The-Fly: GenePix Pro automatically graphs a Histogram of the distribution of pixel intensities. The image and the Histogram are updated dynamically as scanning proceeds; both can be used to optimize scanner settings while you scan. Adjust the Resolution to Your Application: Use the 40-micron Preview Scan to locate the array and optimize hardware settings, and the Data Scan for accurate quantification. 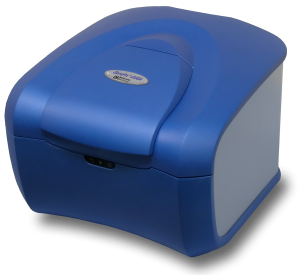 The GenePix 4100A Microarray Scanner offers selectable resolution between 5 and 100 microns, just about right for your samples. Greater Signal-To-Noise Ratio: The detection system employs a low-noise, high-sensitivity PMT to convert photons into an electrical signal, which is then digitized using world-leading ultra-low-noise digitizer technology. Adjust the PMT gain and average multiple line scans, to achieve even greater signal-to-noise ratio (SNR) on faint samples. Sample Tracking: GenePix® Pro Acquisition and Analysis Software automatically reads barcodes from Preview Scans, Data Scans, and saved images, and are exported with extracted data. GenePix® Pro Software from Molecular Devices is the industry standard in microarray image analysis because of its unique combination of imaging and analysis tools, visualizations, automation capabilities, performance and ease-of-use. With multiplexed image acquisition and automation features of GenePix Pro 7 Software, the best just got better.